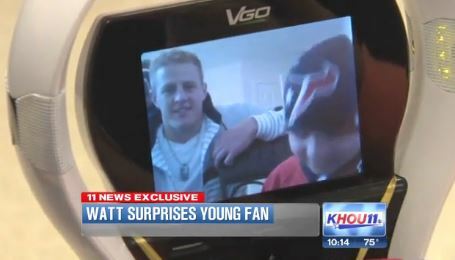 After JJ Watt heard the story about Cristian Beasley naming the VGo robot he uses to attend school "Watt," the Texans star decided to suprise him at home. In a ruse orchestrated by the Houston Texans, NFL Films, Cristian’s family and school, and the Education Service Center Region 6 that coordinates the VGo program, Watt arrived unannounced at the home where Cristian operates the robot. He quietly snuck up behind him and gave the boy the best surprise of his young life. “What are you working on,” Watt whispered as Cristian turned arou nd. “Oh my God,” said the 6th grader dressed for school in his JJ Watt jersey and a Houston Texans knit cap. “Oh my God,” is all Cristian could mutter again. The Texans defensive star spent more than two hours at the Splendora home. He gave Cristian signed shoes, gloves, and more including a signed JJ Watt jersey which he autographed with the words “stay strong” on the back. They played hacky sack and football in the backyard, mugged for photographs together, and posed for photographs with a large contingent of Cristian’s equally star-struck family. 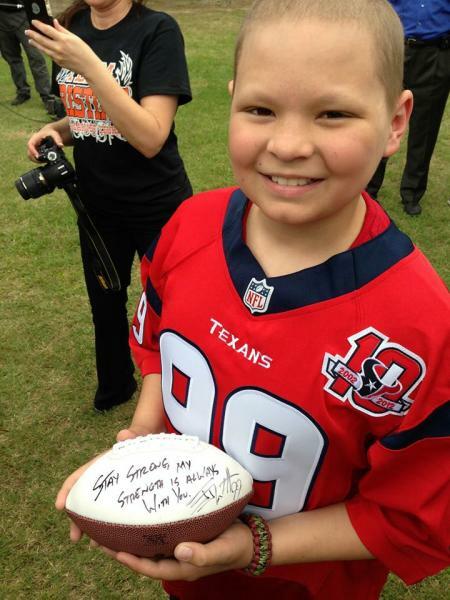 He also autographed a football with the words "Stay strong. My Stength is Always with You." Watt also took turns at Cristian’s laptop driving the VGo robot through the halls of Greenleaf Elementary School. Of the VGo, Watt later tweeted "Honored that Cristian named his robot after me. Thankful for the technology allowing him to attend school from home." And at the end of the day, Watt and Cristian made the 10-mile trip to the school to visit the other students in person. “It’s awesome. 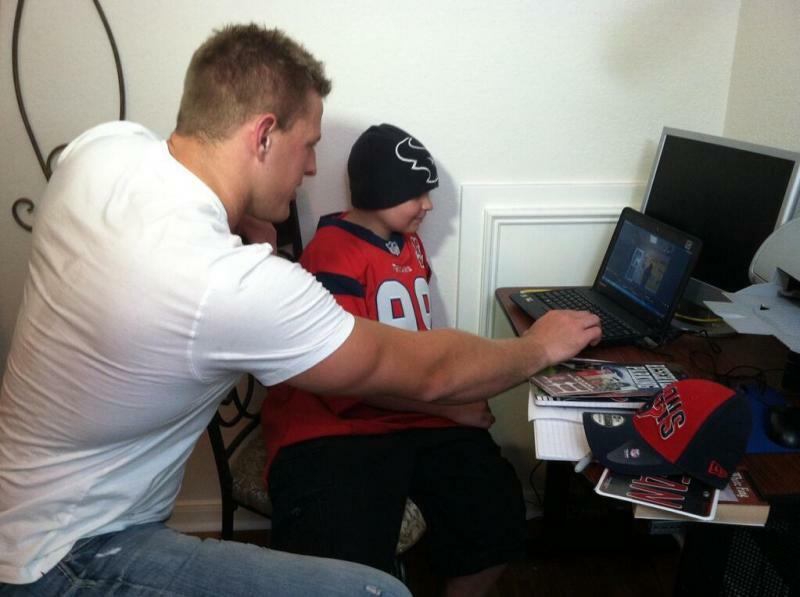 It’s still awesome,” said Cristian during Watt’s visit. “It means a lot and I’m never going to forget it, never,” said Cristian. “It’s always going to be in here,” he said pointing to his head. “And in here,” he said putting his hand over his heart. Cristian starts another round of chemotherapy on Monday so his mom said the surprise visit by the football star couldn’t have come at a better time. Among the gifts he gave the boy were a set of “eye black” football patches that Watt told him would make him look tough. He told Cristian to use them when he needed an emotional lift and to remember that he always has a robot and a real guy named Watt rooting for him. 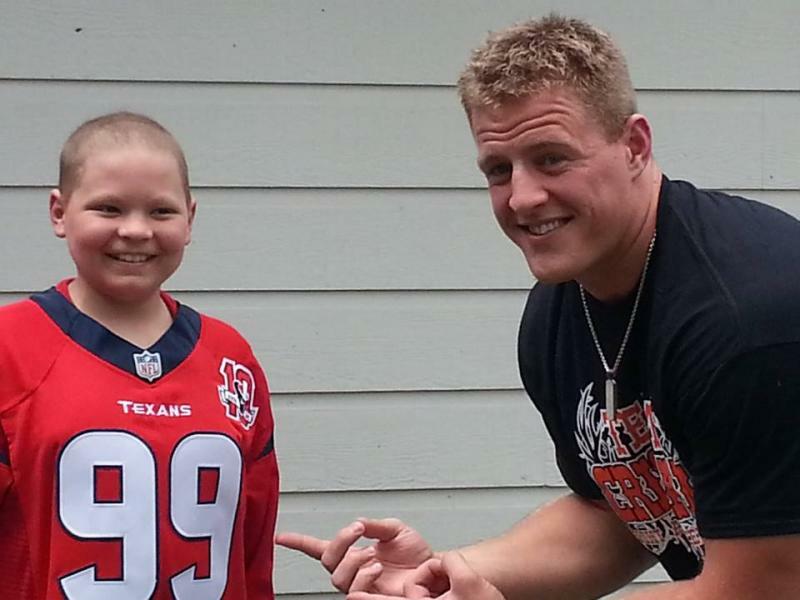 Watch the video of JJ Watt surprising Cristian and driving the VGo below.